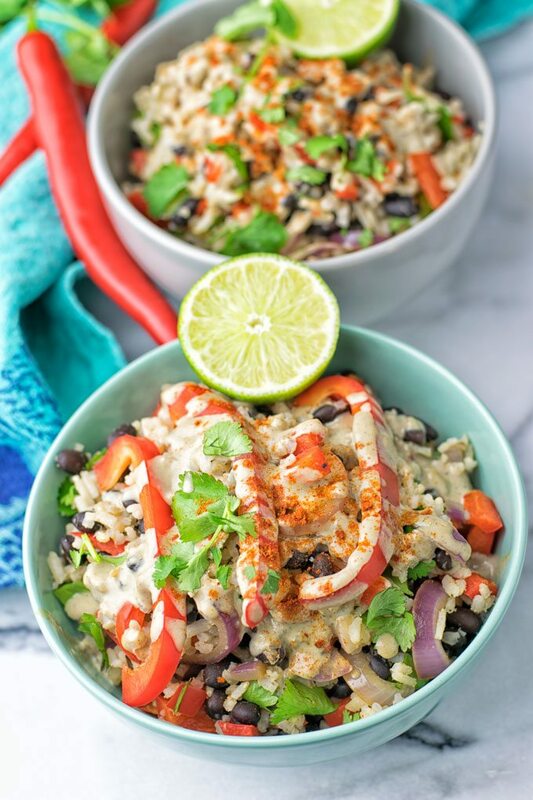 This Healthy Mexican Cheese Rice is made with just 5 simple ingredients and in 2 easy steps. 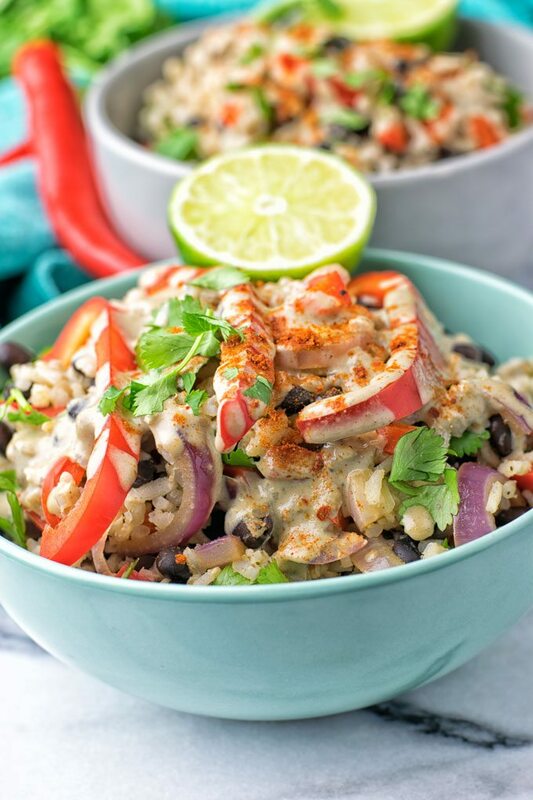 A flavorful crunchy dish showing how delicious vegan Mexican style food is. 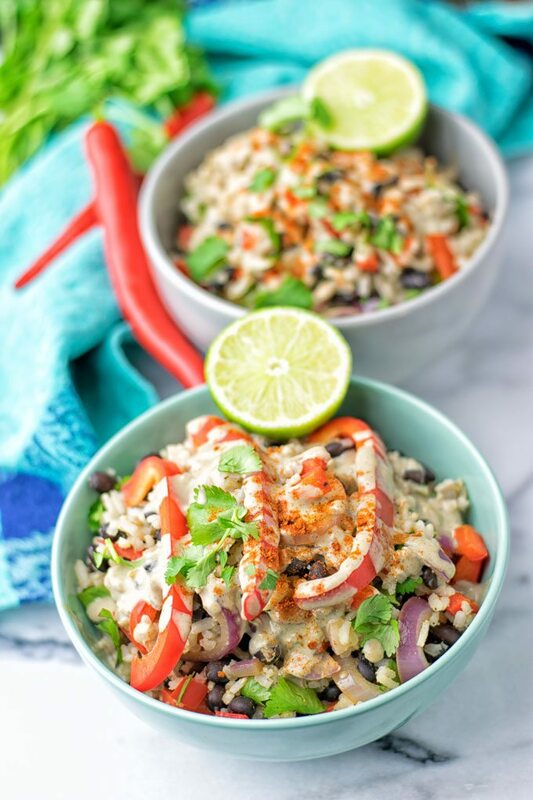 If somebody told me I could only have a single style of food for the rest of my life, I’d have a hard time choosing between my two favorites: Mexican food and Mediterranean Food. Both happen for me several times a week and for sure I never get bored. In the end though, I think my choice would be Mexican. We just have such a long history together. Pre vegan days, there was a Mexican Restaurant just a couple of blocks from my place. And of course these times I was so love in the flavors and tastes. There was each week a big buffet where you can eat as much as you like – the full “all you can eat” package. There was one dish I truly ate every time when I was around there: a fried rice. Just thinking about it, I can smell it. It was a deep fried rice with a heavy, creamy cheese sauce. No secret that this combination was definitely the reason for why I had a thing for this dish. Honestly, I could eat a lot of plates. The combination of the rice, beans, and that rich cheesy sauce was just something that I got addicted to. Back in those pre vegan days, I couldn’t imagine how I could I live without cheese. Luckily, now I don’t miss any cheese because I know all the amazing ways of how to make vegan cheese. And not only that but also a Mexican Cheese dip, a Vegan Cheese Sauce, or my Easy Vegan Pimento Cheese. There is so much more to enjoy and discover. Use the search bar, friends. So you see, when you can enjoy dishes that are all homemade, vegan, gluten free, and made with whole food ingredients, who is going to miss anything?. Looking back, this Mexican Fried Rice at the restaurant was not only not vegan with scrambled eggs and bacon added. It was also rather greasy after frying it with a lot of oil, topped with that cheese sauce which was made with a lot of cheese, butter, and heavy cream. Not so with my Healthy Mexican Cheese Rice. Come along, friends, and I’ll help you to discover my favorite dish pre vegan days is a plant-based version. Let’s enjoy a meal that is cheesy, vegan, gluten free, flavorful, not fried, healthy, addictive, easy, and so delicious. Are you ready? We’re heading to the kitchen together to make this now. First cook the rice according the cooking directions. While the rice is cooking, heat a small skillet with a bit of oil (or just vegetable broth for oil free cooking). Briefly saute the pepper and onion, set aside. If you don’t have a batch of my Mexican Cheese Dip ready, now is the time to make it. When all is done, it’s already time for assembling: combine rice and all the other ingredients with the Mexican Cheese Dip. You can get creative how to do this exactly. Mix all ingredients with the sauce or just sprinkle it over. 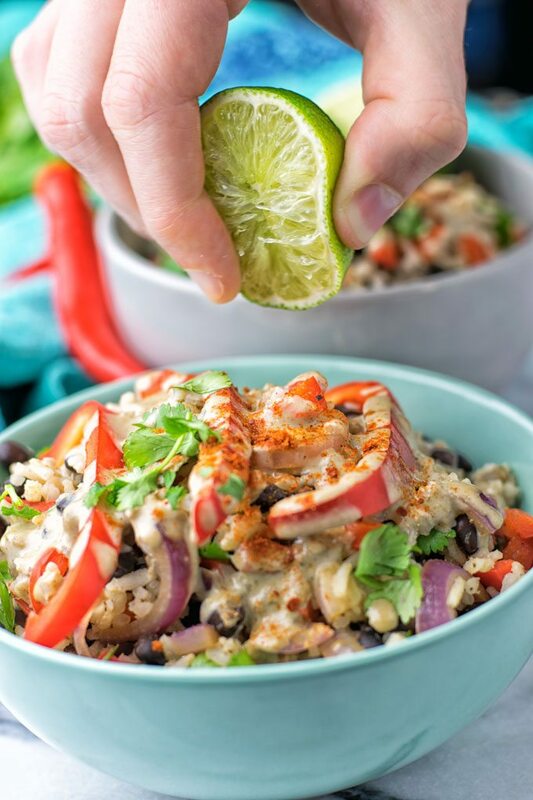 This Healthy Mexican Cheese Rice is totally worth to try, because it’s not fried which alone makes it so much healthier. You only need 5 ingredients and 2 easy steps to get into the loop. Just the Mexican Cheese Dip is so addicting. Seriously I made this several times just for me or friends and everyone devoted it in no time. So whenever you try this, please be strong. Hold back from eating too much of the Mexican Cheese Dip on its own before the rice is ready. I love it so much that I have a hard time not spooning this stuff again and again. But then you don’t have anything left for your Healthy Mexican Cheese Rice and that would be really sad. 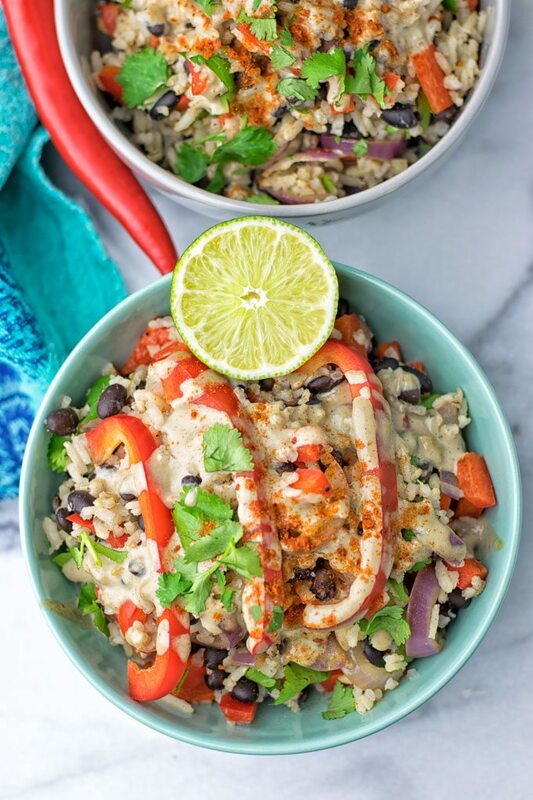 This Healthy Mexican Cheese Rice is a smart powerhouse in many ways. Just look at the center of this dish with the combination of rice and beans. You know these two are truly amazing protein resources, high in iron, folate, and thiamin. It’s no wonder why this combination is a hit in many cultures. 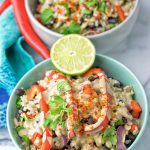 It’s so accessible, cheap, versatile, and this Healthy Mexican Cheese Rice is my easy answer how to get more healthy food in your life. The combination with the Bell Pepper ensures you also get a fantastic amount of vitamin C, vitamin E, and B6. Do I say need more? If you wanna know more just check “What Are the Benefits of Rice & Beans?“. If you try my Healthy Mexican Cheese Rice, give me a tag on Instagram or Facebook as always. Happy to see all your amazing creations. See you, cheers! If you don’t have a batch of my Mexican Cheese Dip ready, now is the time to make it. When all is done, it’s already time for assembling: combine rice and all the other ingredients with the Mexican Cheese Dip. You can get creative how to do this exactly. Mix all ingredients with the sauce or just sprinkle it over.